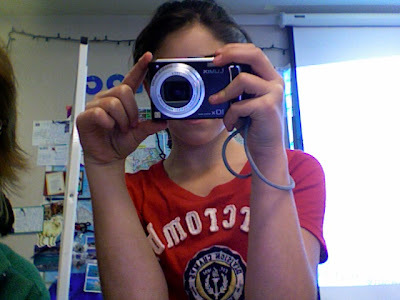 Mrs. Yollis' Classroom Blog: Skyping With Seattle, Washington! The Bulldog Readers live in Seattle, Washington. They have a fabulous blog run by Mrs. Hembree! Here is Seattle, Washington. Notice Puget Sound. Follow this "ocean finger" out to the Pacific. 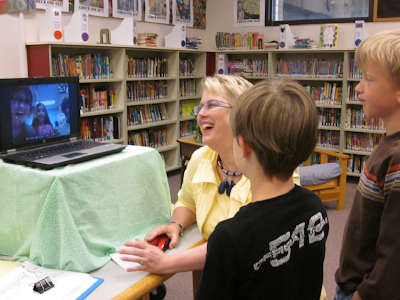 It was great to meet Mrs. Hembee and the Bulldog Readers! We shared facts about California, our community, and our school. 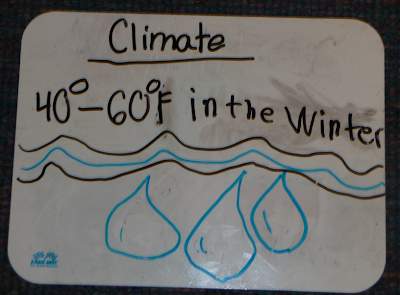 The whiteboard idea came from Mrs. Ranney! It's a good idea to write the facts down so people can hear the fact and see it! It was interesting to share and compare! 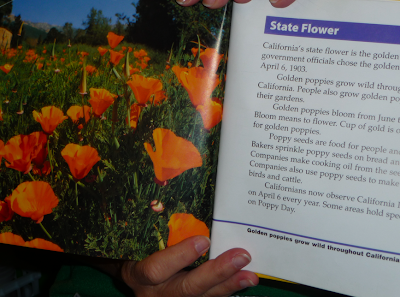 This nonfiction book was helpful for sharing about our state flower, the golden poppy. 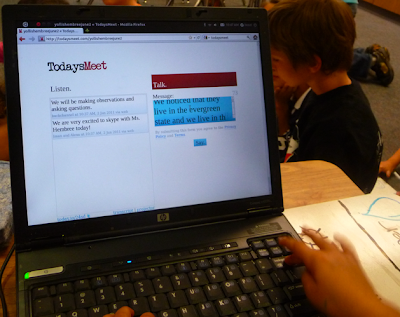 We recorded the information on TodaysMeet. We had a second computer for backchanneling. That was the fist attempt with this Skype strategy, and Mrs. Yollis and her students might try it again. Panda was thrilled to meet the Bulldog Reader's mascot, Reese! We would like to thank the Bulldog's music teacher, Ms. Gibitz, for being flexible with her music schedule and for leading a delightful song at the end of the Skype call! What a treat! 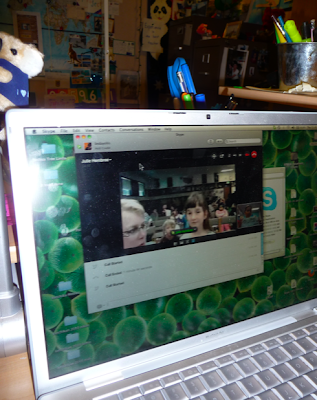 Thank you Alexa, Iman, Adia, Ryan, Amitai, and Miriam for documenting the Skype call on TodaysMeet. Here is the transcript. Does anyone see any incorrect information? (Mrs. Yollis does!) It is difficult to listen and type quickly, but review the transcripts to see if you can find the population error! Compare and Contrast our two schools. We both live near the Pacific Ocean, but they live on Puget Sound. We both have hilly communities. We both play handball at recess, but they call it wall ball. We both have have lovable mascots! We have 24,000 people in our community and they have 77,000. They sometimes get snow, and we don't get any. 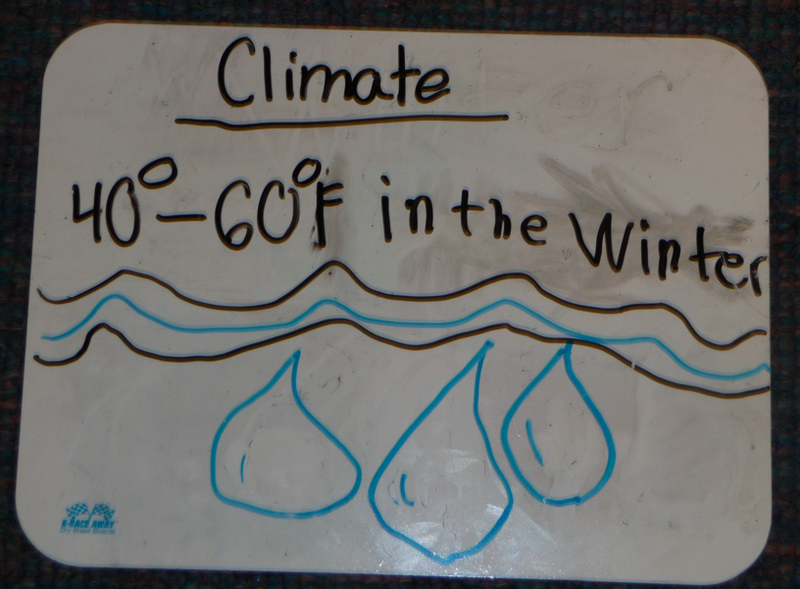 Their elevation is 14-500 feet above sea level, and we are slightly higher at 800 feet. 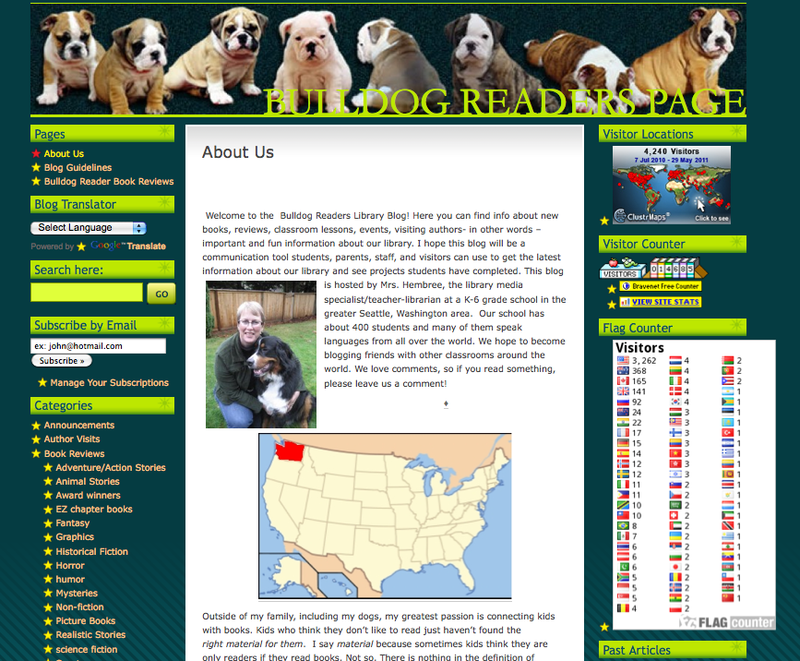 Our school is a K-5 elementary school, and the Bulldogs go from preschool to 6. What did you enjoy about the Skype call? Please add any additional similarities or differences. 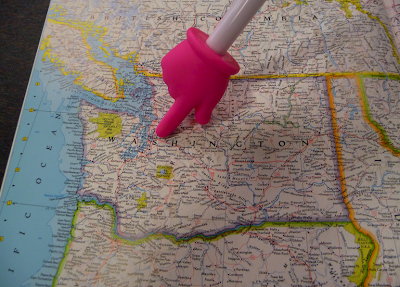 What would you like to learn about the state of Washington? wow once again this is another wonderful skpying session you have all had and with Mrs Hembree and the Bulldog readers! I wish I was there with you all. Thank you for the great information I really did learn some now facts. I'm very jealous that you were able to skype with Mrs. Hembree! She's a great librarian and a great person. I've never been to Seattle before so it was great to be able to learn some facts about it. It's amazing how large her community is. It is much larger than where I live. Thanks for sharing all of those great facts! June 16 ~ School is Out! 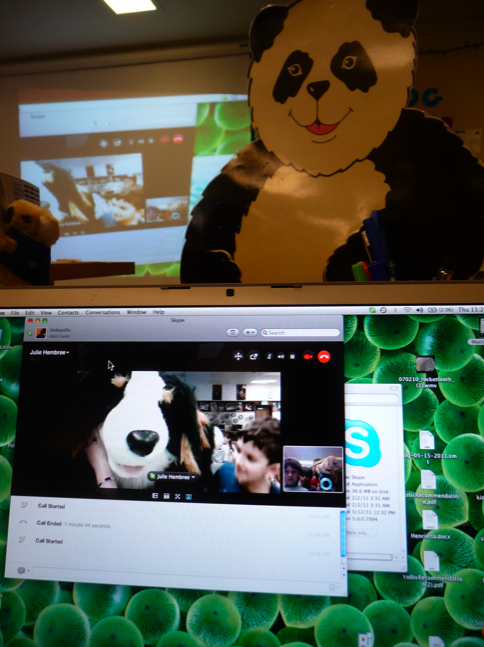 Mystery Skype Call With Mr. Avery! June 14 is Flag Day! Video: National Geographic's Giant Map of Africa! 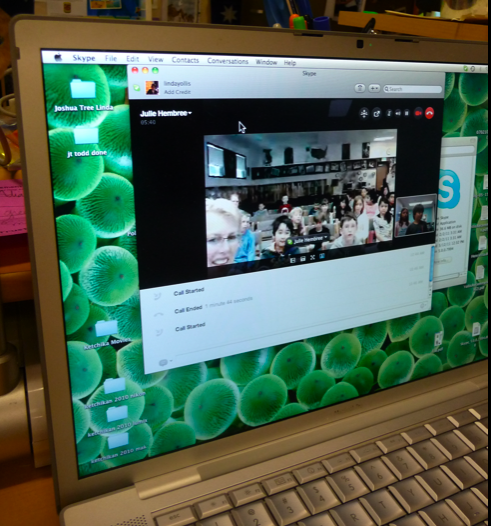 Rural Iowa : Skype Follow-up!